Today, the US and China are to launch, in Washington DC, their inaugural meeting of the Senior Experts Group on International Norms in Cyberspace. This represents not only an earnest effort by the two countries to implement the important cyber-security consensus they reached during President Xi Jinping's state visit to the United States last September, but also an extraordinary move by the two countries to work together for better global governance in cyberspace. As the two biggest economies and beneficiaries of the rapid development of information and communications technologies (ICTs), the US and China have broad and abundant shared interests in global cyberspace governance through intensified cooperation. The world today, whether online or offline, is a network of both visual and physical reality. The ICTs have brought a qualitative leap in productivity, and empowered innovation, especially in artificial intelligence, IOT and three-dimensional printing, which serves as a new driver for global economy. The digital economy is taking up an increasingly large share of GDP in both the US and China, two of the world's key players in cyberspace. In the meantime, the two countries have evolved towards a community of shared interests with each having a stake in the other. China, for its part, has 700 million Internet users and 60,000 IT companies, among which 50 have been listed in the US, including big names like Alibaba and Tencent, with a total market cap of over 500 billion US dollars. Meanwhile, there are over 2500 IT companies from the US with investments in China generating higher returns. Qualcom, for instance, earned half of its profits in China, whereas Apple finds 50% of its new users in China. While contributing to their respective economies, the IT companies in both countries are also helping to deepen their bilateral cooperation. The digital and technical cooperation is, in effect, part and parcel of their bilateral cooperation. Today, the cooperation between the two countries on this front has become even more relevant and imperative. China is calling for new drivers of growth, as its economy has entered a new normal. Internet, in this context, has a greater role to play. China is intensifying its efforts to shift its economic development model and adjust its economic structure through vigorous implementation of, inter alia, its national strategy for development based on growing the Internet sector, national big-data strategy, the "Internet Plus" action plan as well as its programs for in-depth integration of digital and real economies. Likewise, in the case of the US, much hinges on a robust digital economy and its intensified cooperation with China, if it is to have a sound economic recovery and greater competitiveness. Over the past 30 years, the growth rate of its digital economy is five times that of the traditional industry. Digital economy accounted for 4.7% of its GDP in 2015, which has become one of the most dynamic sector in the US. It is thus axiomatic that the cooperation between the two countries are in line with their common interests. Such cooperation, in the meantime, also contributes to the sustainable development of global cyberspace and the advancement of human society. - Frequent infringements of individual privacy and cyber-enabled theft of intellectual property rights as well as mounting cyber attacks and crimes. These malicious activities have put into jeopardy the legitimate rights of the general public, the economic interests of countries and the innovative capacity of society. China's websites suffer from an average of nearly 400 large-scale cyber attacks on a daily basis, and the attacks from abroad continue to rise rapidly. The US, for its part, also faced a wide array of cyber intrusions, ranging from criminal activity to cyber espionage. - Cyber terrorism, a global public menace, poses a threat to social and public security. Terrorism, coupled with the Internet, has now been evident as the main source of violent and terrorist activities. The IS, East Turkistan and other terrorist groups take online audio and video as an important tool for dissemination of extremist ideology and terrorist tactics. They also use Internet in their organization, planning and implementation of terrorist attacks. - Cyber attacks on national critical infrastructures. Such attacks pose severe threat to national economy and peoples' livelihood. As the neural centre of economic and social operation, the critical infrastructures in such areas as finance, electricity, communication, transportation constitute the top priority in cyber-security. Any problem, once occurred,will lead to severe traffic disruption, financial chaos or power failures with devastating consequences. To address such challenges, the international community can only work together through intensified cooperation. There are no alternatives whatsoever. No countries can do it alone. 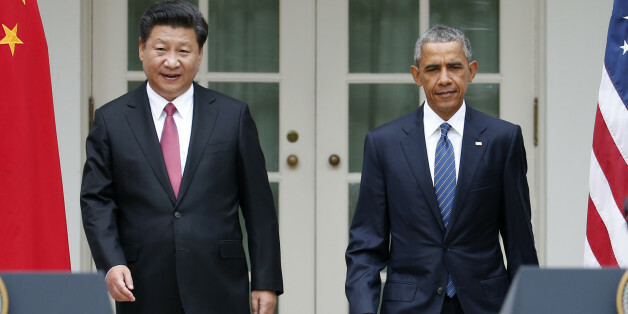 It is thus the shared responsibility of the US and China to harness the global cyberspace. While it is true that the US and China may sometimes be at odds with each other on some of the cyber issues, it shouldn't affect the cooperation between them. To fling accusations at each other is not a solution. Only through cooperation, can the US and China forge a unified and prosperous cyberspace. Otherwise, the cyberspace will divide and wither. The important cyber-security consensus the two countries reached during President Xi Jinping's state visit to the United States last September is a classic case in point, in which the two sides managed to address their differences through dialogue and cooperation. Though relatively new, cyberspace is by no means a lawless frontier. It should not be a breeding bed for crimes, still less, a wrestling ground for countries. To this end, it is essential that all relevant parties engage in an objective study, in the light of the very character of this new development, on the applicability of international laws without pre-conceived views. It is essential, in the meantime, that all relevant parties embark on a process, in view of the prevailing situation, of elaboration of the relevant international legal instrument in cyberspace governance within the framework of the United Nations, focusing on international norms in cyberspace in the first place. Cyberspace is a common space for human activities, and cyber-security is, therefore, a key issue which bears on the sovereignty, security and development interests of all countries. The international behavior should be grounded in such fundamental principles of peace, sovereignty, co-governance and universal benefit in harnessing cyberspace. Today's inaugural meeting of Senior Experts Group on International Norms in Cyberspace is most timely. The US and China should intensify their dialogue and cooperation on cyber-security with the objective of making it a bright spot in their bilateral relations. As P5 and major players in cyberspace, the US and China should demonstrate their responsibility in advancing the process of building international norms in cyberspace, with the objective of fostering a peaceful, secure, open and cooperative cyberspace, which benefits people of all countries and safeguards international peace, security and stability. Ambassador WANG Qun is Director-General of the Department of Arms Control and Disarmament at the Ministry of Foreign Affairs, People's Republic of China.